Hello again! I hope you had a wonderful weekend. Ours went by far too quickly, and was… a bit of a mixed bag. Friday night I made this tasty coconut red curry soup, we played games, and had a dance party in Aria’s room– flashing colored lights and blaring music included. It was great. I still smile when I think about how happy she was spending her birthday money on her own disco ball. Saturday, on the other hand, was not so pleasant. Do you ever have days where everyone in the family wants to do something different? No one can agree on a plan, everyone is a bit “off”, and the day spirals into communal grumpiness. That was our Saturday. As we were putting the kids to bed that night, talking about how we had wasted one of our precious weekend days, my daughter (in her sweet four-year-old voice) said, “Everybody’s different. That’s just how life is.” So there’s a bit of wisdom. Thankfully, by Sunday we had all learned our lessons and agreed to compromise, and it was fantastic. The sun was shining, we went out-and-about, the kids were happy, the adults were happy. We ended the weekend on a great note. 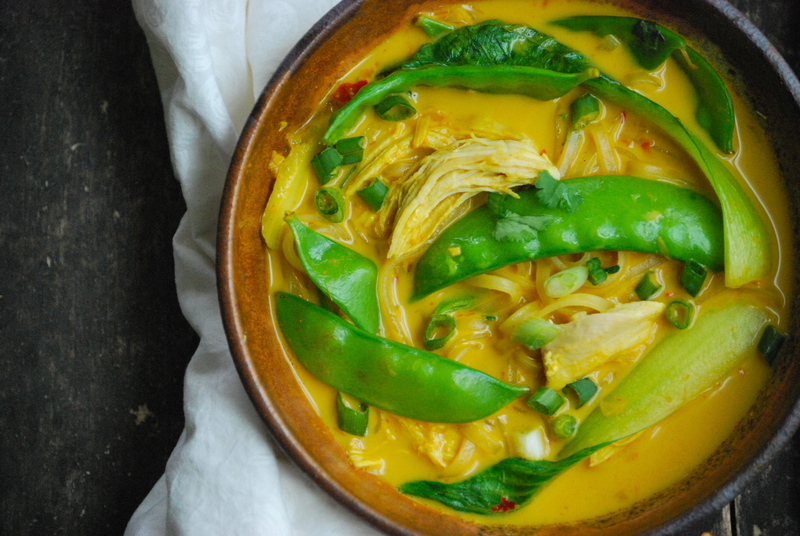 Anyway…back to this soup that I threw together for “Friday Night Fun.” It’s loaded with tons of healthy ingredients– brown rice noodles, bok choy, snow peas, turmeric, chicken, and homemade red curry paste. 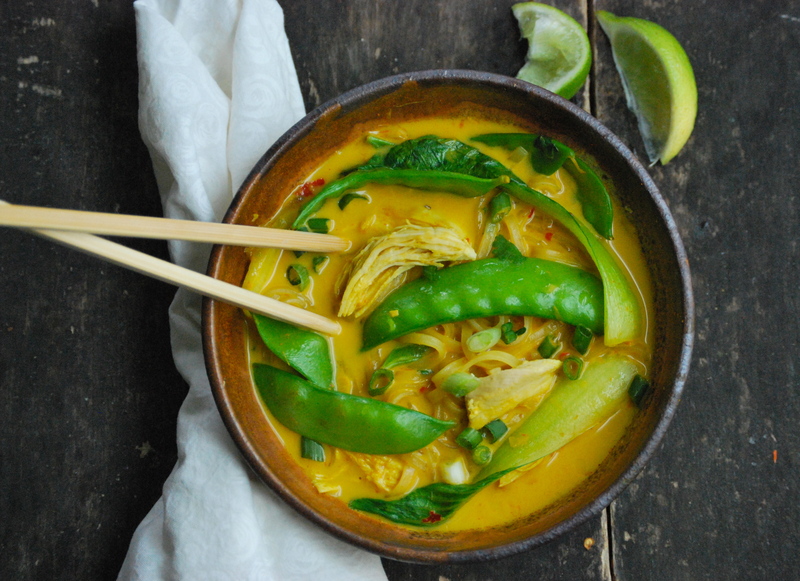 It’s all in there, combining to make a warm and filling soup laced with those delicious Thai flavors that we love. 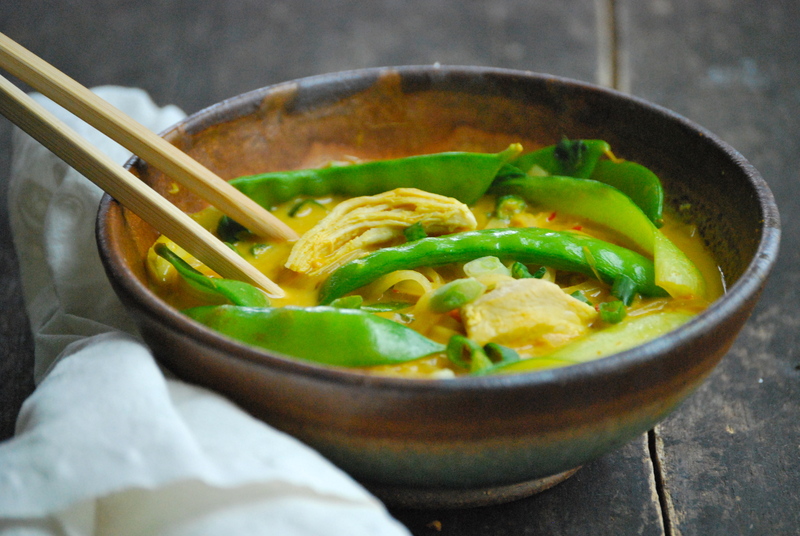 The idea for this soup came about awhile back when I was making some other Thai dish. I realized that I was out of curry paste, so I took a look at the ingredients on the empty bottle in the fridge. I was already familiar with making my own condiments ( here and here), so I decided to give homemade curry paste a shot. And since the the first listed ingredient was sugar, I figured it was an opportunity to make a healthier version to use in other meals. One of the things I love about making homemade versions is that there really isn’t a right or wrong way. It’s fun to go ‘off-book’. As long as you pay attention to how the flavor combinations develop as you add ingredients, you’ll be fine. Cooking with this philosophy opens up so many possibilities. Have the courage to take a chance, and rely on your taste, and it’ll be a game changer for your kitchen skills. 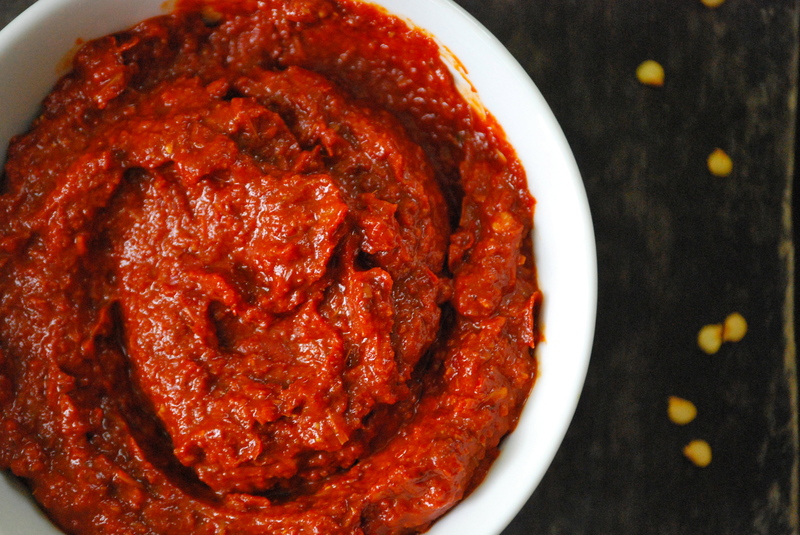 At any rate, I love the result of this red curry paste. I decided to not add anything sweet to the actual paste. Instead, I made up for any needed sweetness by seasoning the whole soup. Use your judgement to fit this dish to your family’s taste. The same goes for the dried chili peppers. 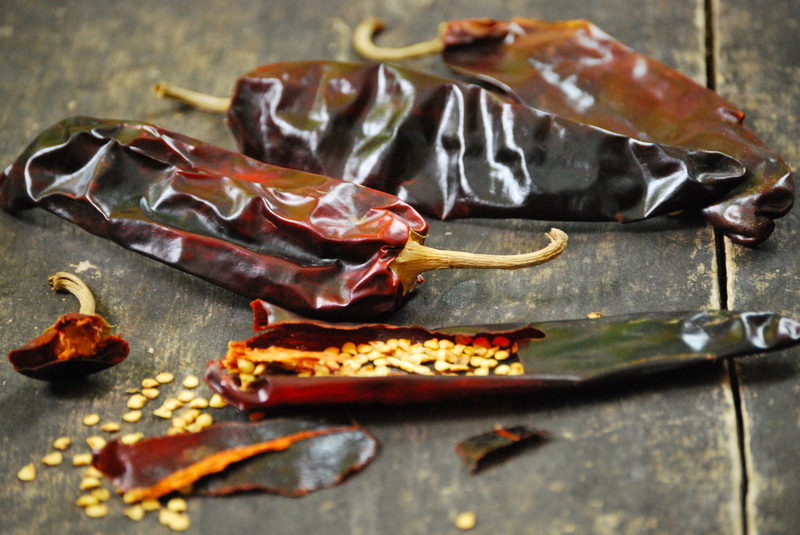 Here, I used a mild one– Guajillo. Penzeys carries all sorts of dried chili peppers in different ranges of heat. Use whichever you prefer. And don’t be put-off by the anchovies in the paste. They add a little umami flavor, but you won’t taste anything fish-like. Trust me on this one. One final thing on the paste, it’s a nice idea to make this a bit ahead of time to allow the flavors to come together. You will have leftovers that can be stored in the refrigerator. 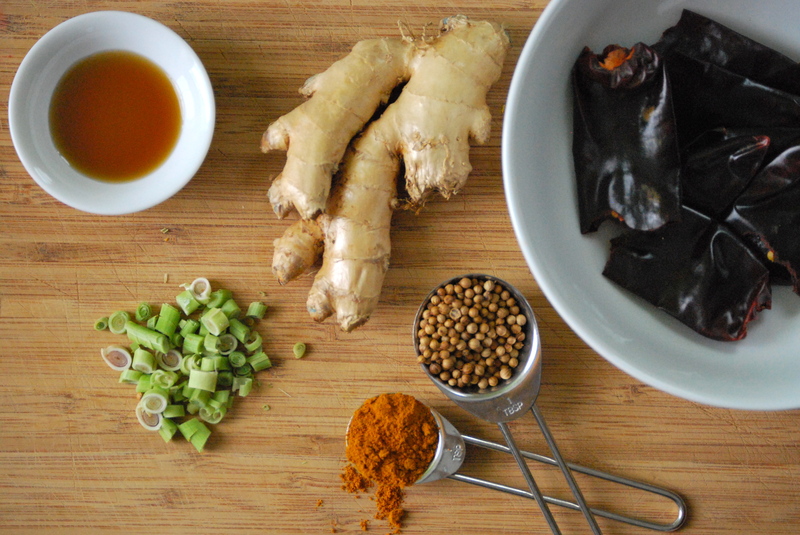 Of course, if you decide not to make your own curry paste, this soup will still be wonderful with a store-bought version. I love cooking with coconut milk (the canned version, not the carton). Here, I sweetened the soup with a bit of honey, but palm sugar (or regular) can also be used. The vegetables are interchangeable, of course. A couple of hefty handfuls of spinach are a nice replacement for the bok choy. Red pepper (sautéed a bit beforehand) also goes very well in this dish. You can roast your own chicken, bake some chicken breasts, or use store-bought rotisserie chicken for an even quicker meal. Or you can leave the chicken out entirely for a vegetarian option. If you happen to have kaffir lime leaves on hand, throw them in– they will be brilliant. I didn’t this time around, but the extra lime juice worked just fine. A note about the bowl in the photo– isn’t it lovely? You know I advocate using local ingredients as much as possible, but I also have a soft spot for local artists. The gorgeous bowl in these photos is from Evla Pottery. I fell in love with their work years ago when my husband surprised me with a large decorative plate. Last week while on a stroll with Aria, I stopped in to have a look around and was smitten with these bowls. Evla is run by a husband and wife who craft wonderful pottery and paintings. They have a beautiful store, and I’m thankful that they’re just a few blocks from our home. Stop by if you’re in the neighborhood, or take a look on-line if you need to treat yourself or another to something special. To make the red curry paste: Place the dried chili peppers into a small bowl, pour boiling water over them and cover the bowl with a plate. Let sit for 30 minutes. Reserve some of the soaking liquid. Using a small mini food processor, add the peppers, lemon grass, ginger, curry powder, ground coriander, fish sauce, shallots, garlic, anchovies, and 3 tablespoons soaking liquid. Blend for a few minutes until very smooth. Cover and refrigerate until ready to use. To make the coconut red curry soup: In a large dutch oven, heat the olive oil. Add the shallots and ginger and sauté for a minute or so. Add the curry powder, turmeric, ground coriander, and red curry paste and sauté for another 30 seconds. Add 5 cups of water along with the lemon grass stalk, fish sauce, coconut milk, and honey. Bring the soup to a boil, then reduce heat to low-medium and let simmer for 15-20 minutes, or so. Meanwhile, bring a large kettle full of water to a boil for the brown rice noodles. When the soup tastes as if the flavors have melded, cook the rice noodles in the boiling water for about 8-10 minutes, or until they are al dente. Remove the stalk of lemongrass. About 2 minutes before the rice noodles are done, add the snow peas , bok choy , and chicken to the soup. Strain the noodles and add them to the soup. Stir in most of the green onions and cilantro, reserving a bit for garnishing the top each bowl. Be sure to serve a lime wedge or two along with each bowl– the lime really brightens the soup and brings all of the flavors together. This soup is best enjoyed immediately when it is done. Enjoy! If you’ve spent even a small amount of time here, you know that I love cookbooks. Even on hectic days when my two little ones run me ragged, I try to find time to clear my head with a warm cup of coffee and a few peaceful moments paging through recipes. So what makes a cookbook ‘good’? Well, rather than listing page after page of instruction, for me the best cookbooks are like settling in and sharing ideas with a comforting friend. They have stories wrapped around a theme, emotions that tie the dishes to the author’s life and loved ones, and– obviously– brilliant food. I want to know the recipes are part of the author’s life, that they’re important enough that she needs to share them. I want to make them become part of my family’s traditions and story, because that’s really what eating together is about– shared experiences. One of my favorite cookbook authors is Melissa Clark. Along with her popular column for the New York Times (A Good Appetite), she has authored or co-authored dozens of fantastic works. Her cookbook “In the Kitchen with a Good Appetite” gives you a flavor of her journey to where, and who she is today. I’ve waxed about her creativity in the kitchen and her way with words in this past post. 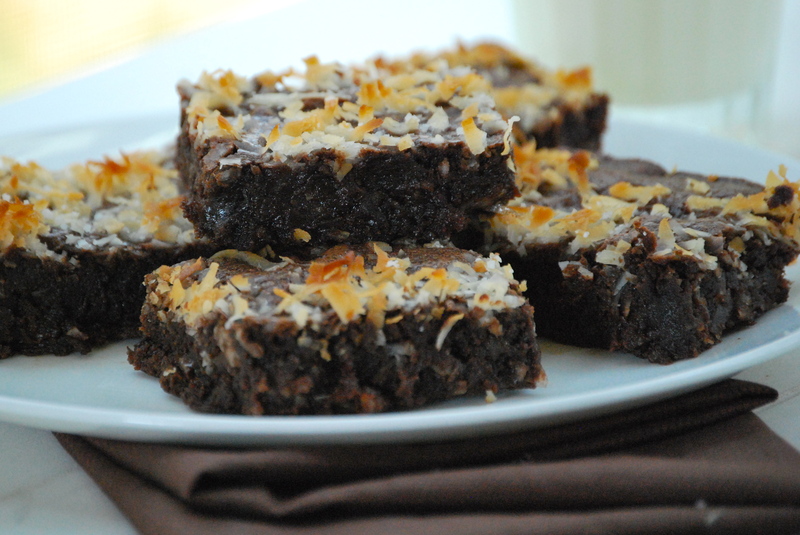 Today’s recipe, these decadent brownies, comes from her new book, “Cook This Now”. In a word, both the brownies and the book are brilliant. In her latest collection, she shares experiences of her life as both a mother and a wife centered around meals for family and friends. The book’s format mirrors the seasons– which is how I try to cook. The individual recipes are varied, creative, and mouth-watering. 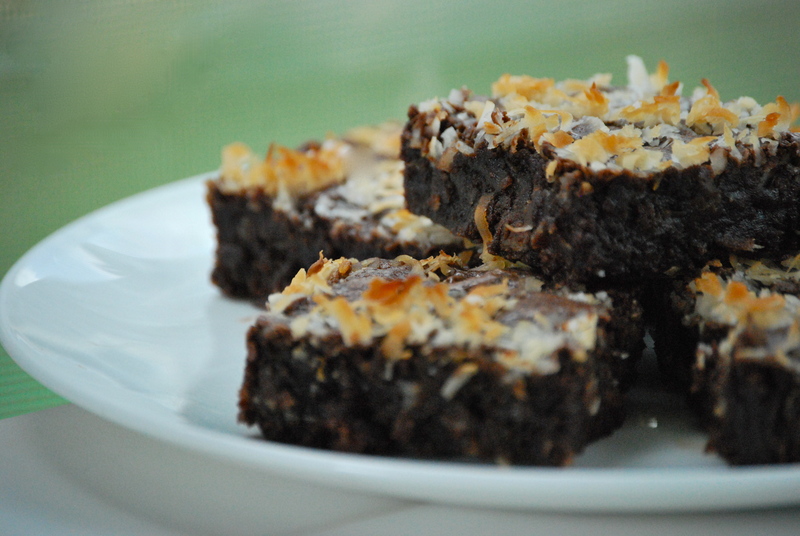 I decided to make these brownies first, to share with a friend on his birthday– he loves chocolate and coconut. 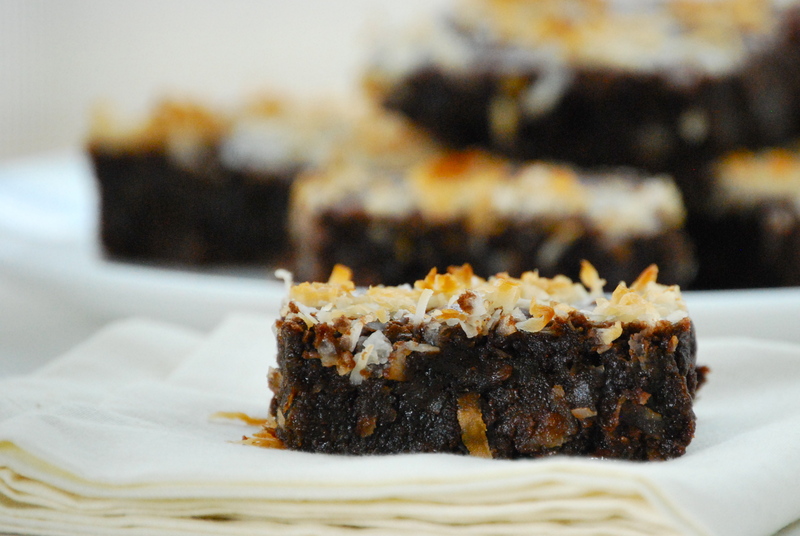 I love the coconut/chocolate pairing, and in this recipe they really work together brilliantly. This is not a normal, cake-like brownie. Instead, it has a moist fudge-y density and texture that delivers a huge chocolate punch. And the two layers of coconut add nice subtlety. The first coconut layer (on top) crisps up beautifully. 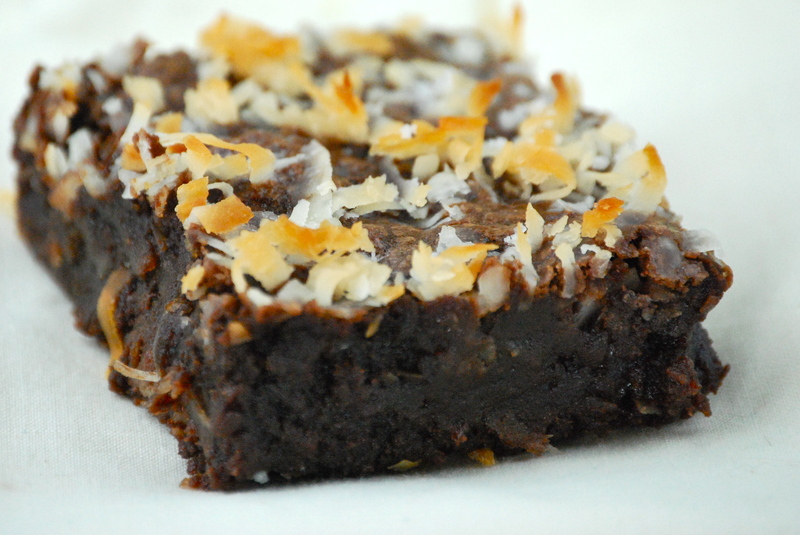 The second (baked into the brownies) provides nice textural contrast to the brownie itself. A sprinkle of fleur de sel on top makes them perfect. Enjoy them with coffee while reading a good cookbook, or share them with a friend. Pre-heat oven to 350°F. Butter a 9 x 13-inch baking pan. 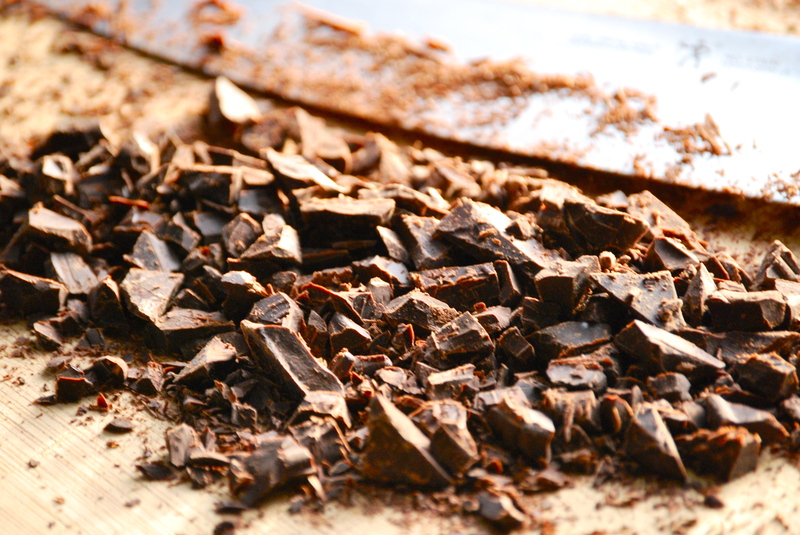 In a large mixing bowl, whisk the cocoa powder, unsweetened chocolate, and boiling water together until smooth. Whisk in the the melted butter and coconut oil. Don’t be alarmed if the mixture looks curdled. Add the eggs, egg yolks, and vanilla, and whisk until combined. Whisk in the sugar until fully incorporated. Add the flour and salt and gently fold with a spatula until just combined. Fold in the bittersweet chocolate pieces. Pour half of the batter into the prepared pan and smooth in out. Sprinkle 1 cup of coconut on top of it. Spread the remaining batter on top of the coconut. Sprinkle the remaining cup of coconut on top of that. Dust with a bit of fleur de sel and bake until a tester inserted into the center of the brownie is just set and shiny, 30-35 minutes. If you test with a toothpick, it may seem wet, which is fine. It will solidify as it cools. It is better to under- bake these brownies, than to over-bake them. Cool completely before cutting into squares. Enjoy!